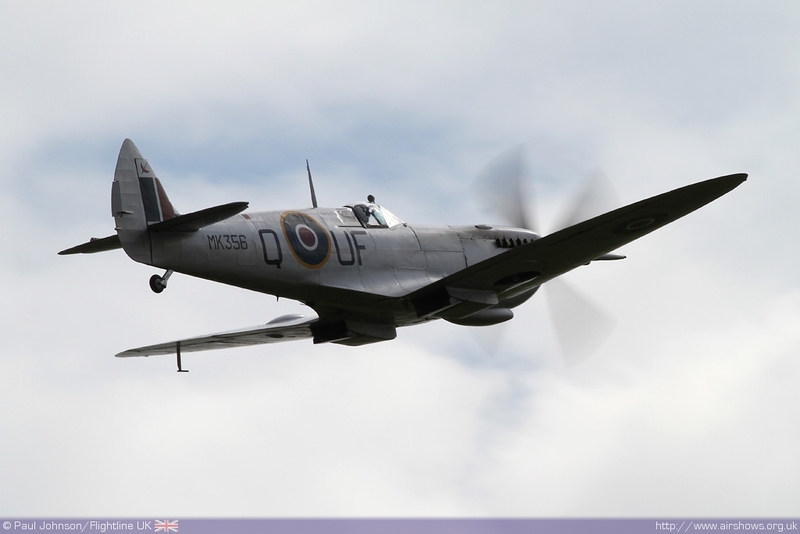 Duxford's first airshow weekend of the year also kicked off the Royal Air Forces's official airshow celebrations of the Battle of Britain's 70th Anniversary. 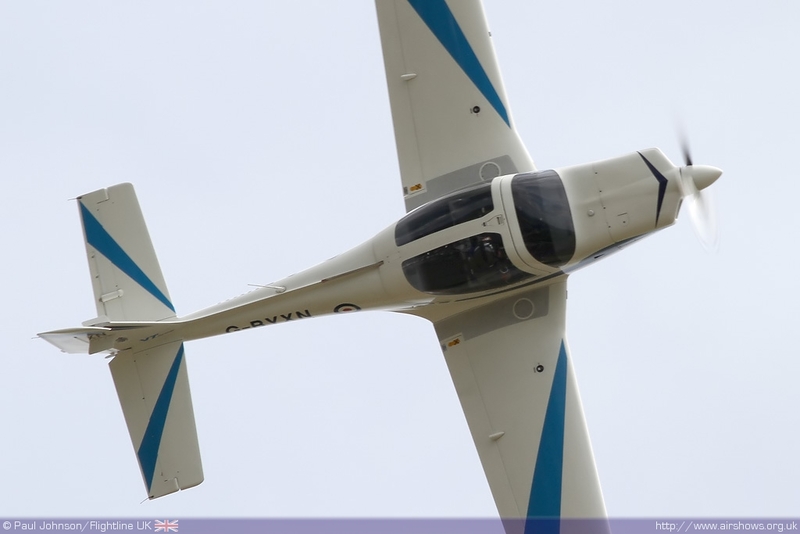 The aim of the weekend was to showcase the current Royal Air Force alongside the that of 70 years ago using the largest airshow presence of the Battle of Britain Memorial Flight of the year. 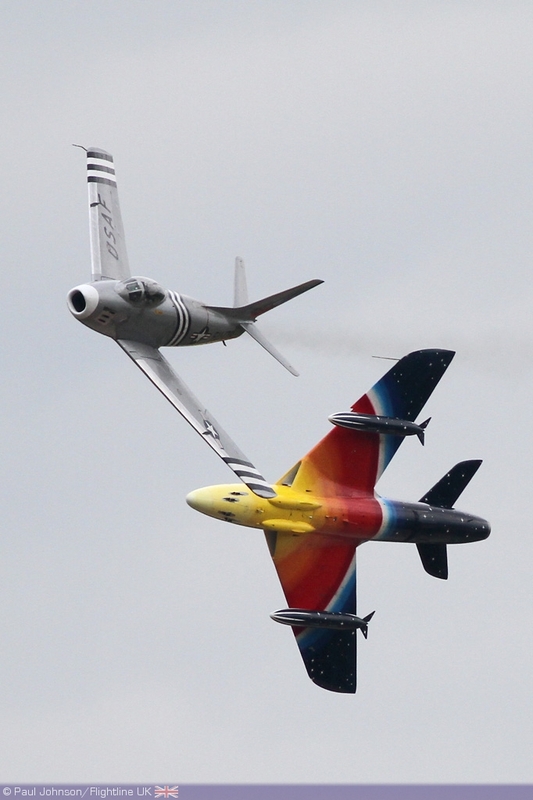 However, things didn't go quite as planned for the main airshow day with the "forecast" return of Icelandic volcanic ash to UK airspace and as well as the threat of some inclement weather during the day. 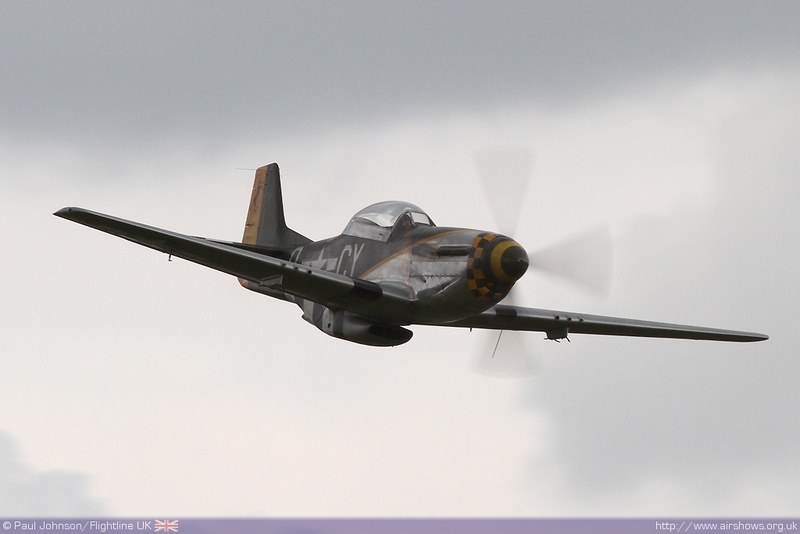 Paul Johnson/Flightline UK reports from the first Duxford event of the year. All photography copyright of the Author. Video highlights courtesy of Planes TV. 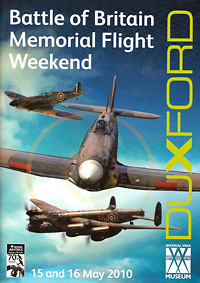 Billed as the "Battle of Britan Memorial Flight Weekend," the events held over the 15-16th May were designed to showcase the RAF's past and present. 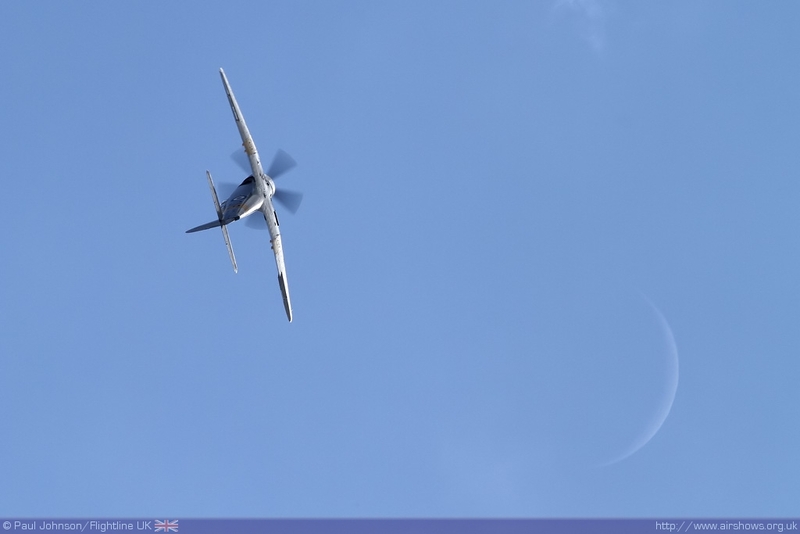 Saturday saw the Battle of Britain Memorial Flight's aircraft providing the centrepiece of a "special interest" day highlighting the work of today's RAF alongside it's equipment from 70 years ago. It was the largest gathering of Battle of Britain Memorial Flight aircraft away from their home at RAF Coningsby this year involving their Spitfire IIa, Spitfire IX, both Hurricane IIc aircraft, the Dakota and finally the Lancaster. 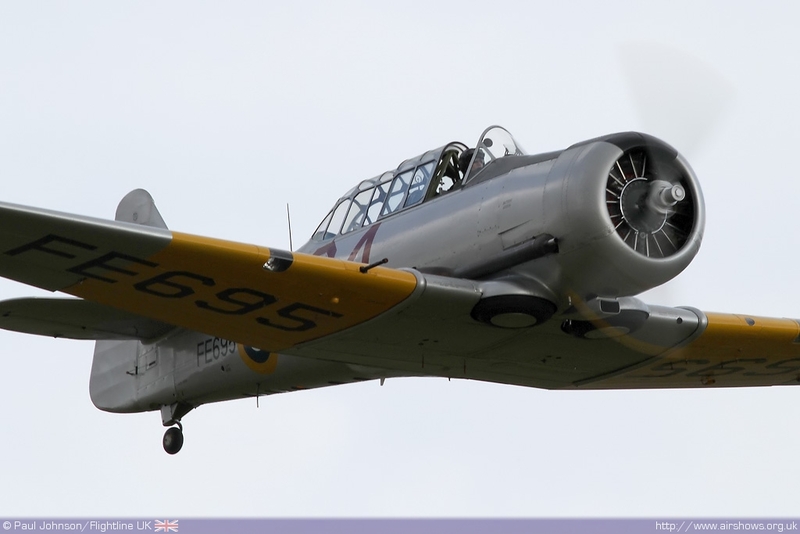 The latter aircraft had only just returned to flight after issues with the fuel system but was unable to land at Duxford due to the light winds. 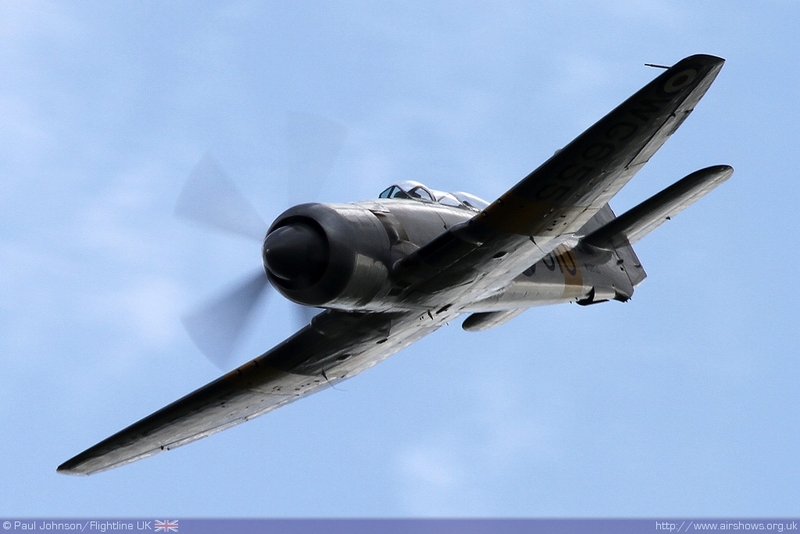 (The aircraft requires at least a 10kt headwind.) 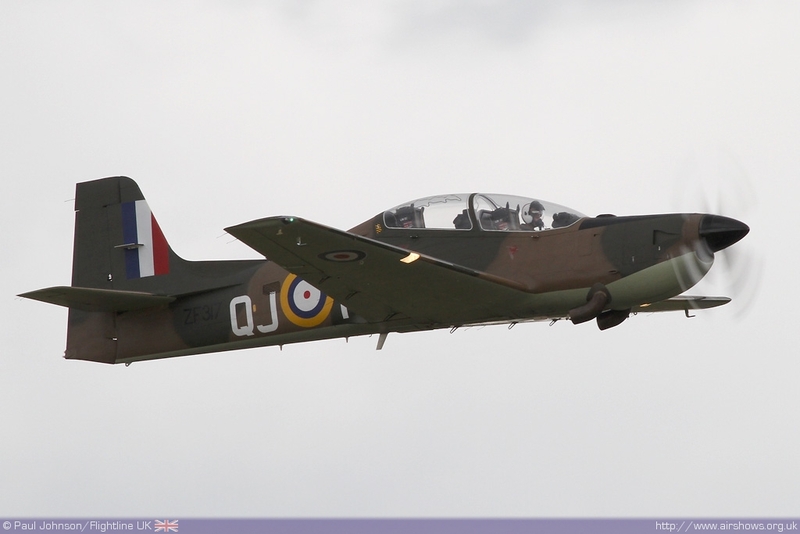 Joining the Second World War machinery was the flight's Chipmunk T10 WG486 which recently hit the headlines due to it's clandestine role during the cold war spying on Warsaw Pact forces in Berlin! 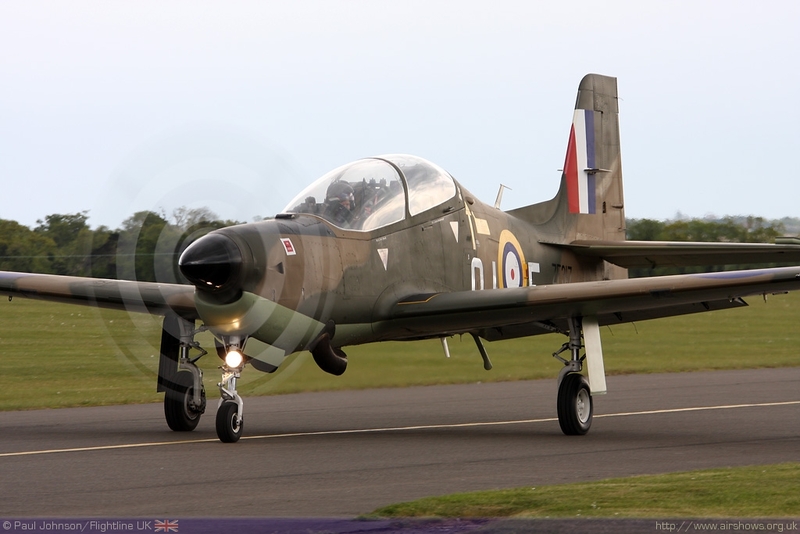 Also on the ground around the BBMF flight were some of the RAF's training aircraft which had arrived in preparation for the main show, namely the Tutor T1 and pairs of Tucano T1s and Hawk T1s. 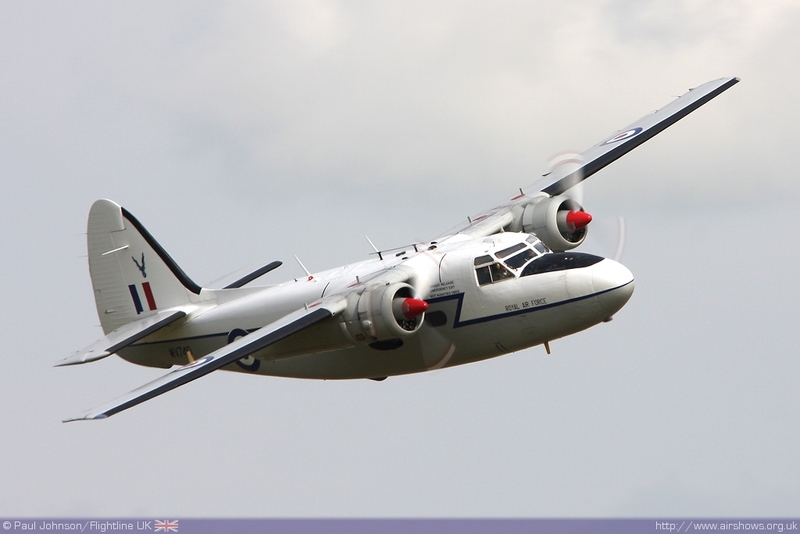 There were also displays of RAF ground equipment as well as another Tutor and a Viking glider. Completing the line was one of the Imperial War Museum's latest acquisitions, Eurofighter Typhoon DA4 ZH590 which is in the process of being prepared for display and currently lacks it's engines. 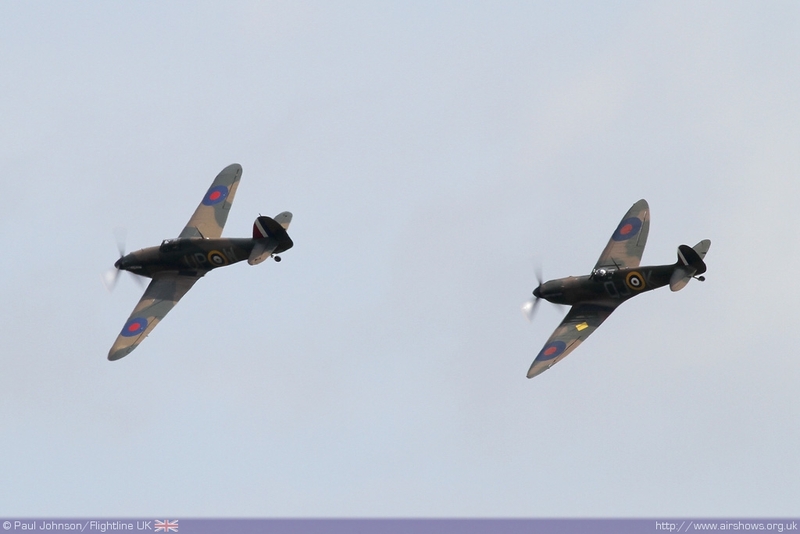 Though Saturday 15th May did not feature any formal flying displays, the BBMF pair of Spitfire IIa and Hurricane IIc did provide a flypast for a poignant sunset ceremony to close the day. While the weather for the Saturday was fairly pleasant, the forecast for the Sunday was less so with a weather front forecast to cross the country through the day which was likely to bring rain showers to Eastern England. However, that soon proved to be the least of Duxford's worries! The continuing eruption of Iceland's Eyjafjallajökull Volcano is still sending ash into the atmosphere and wind can carry that ash into UK airspace. The Met Office is now providing five day forecasts showing the predicted spread of ash over Northern Europe and for the airshow, the ash was predicted to be over northern England spreading south. The maps showed the ash to be remaining to the north of Duxford, but worryingly close. 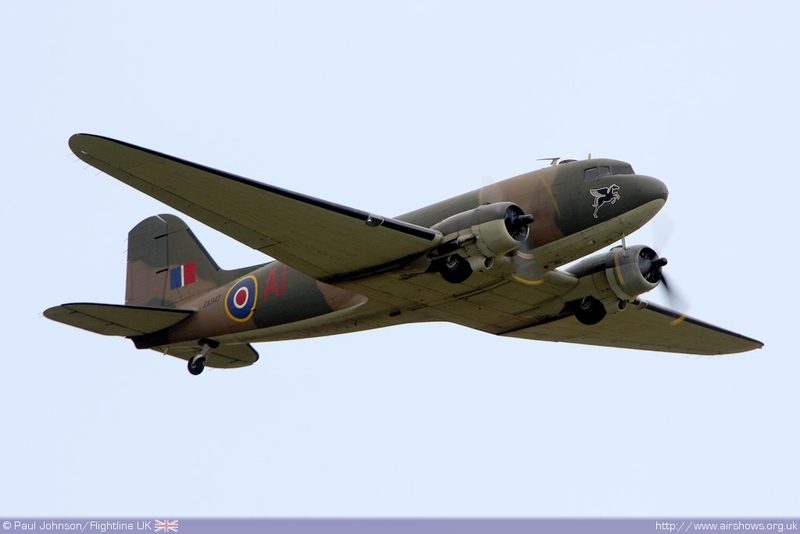 Hope did come in the form of the BBMF's Dakota departing for a flypast over Derbyshire, but question marks remained. 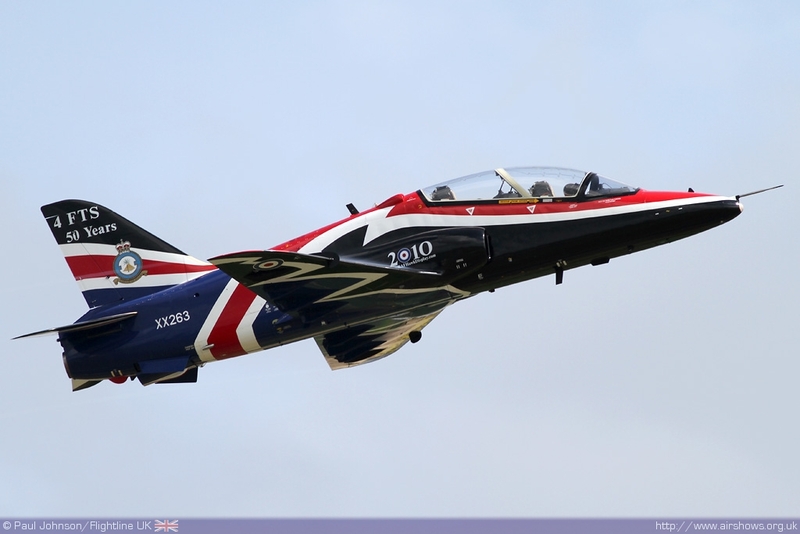 It wasn't until lunchtime that bad news started to leak out of text messages and "tweets" ; the RAF was grounded! It must of lead to some busy rescheduling of the flying programme which suddenly found itself deprived of the Lancaster, Tucano, Hawk and Typhoon displays. 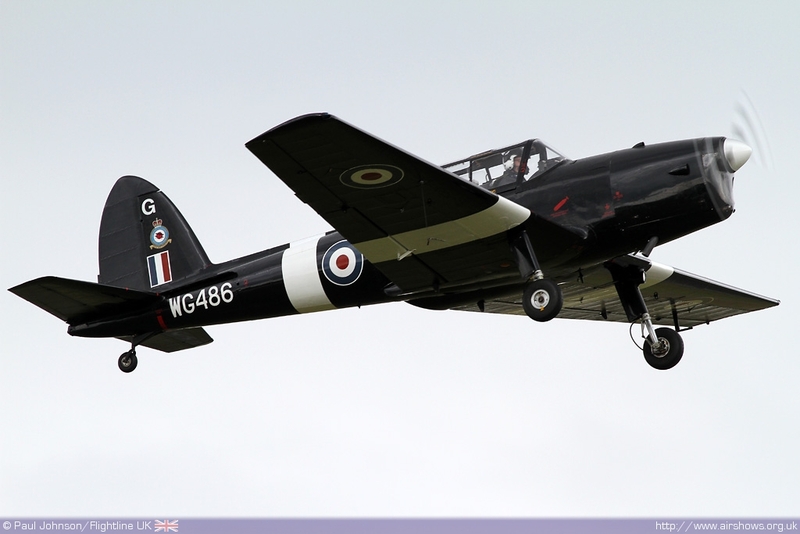 The rest of the BBMF and Tutor would fly however as would the classic jets! However, as we've learnt with ash clouds, things are unpredictable. 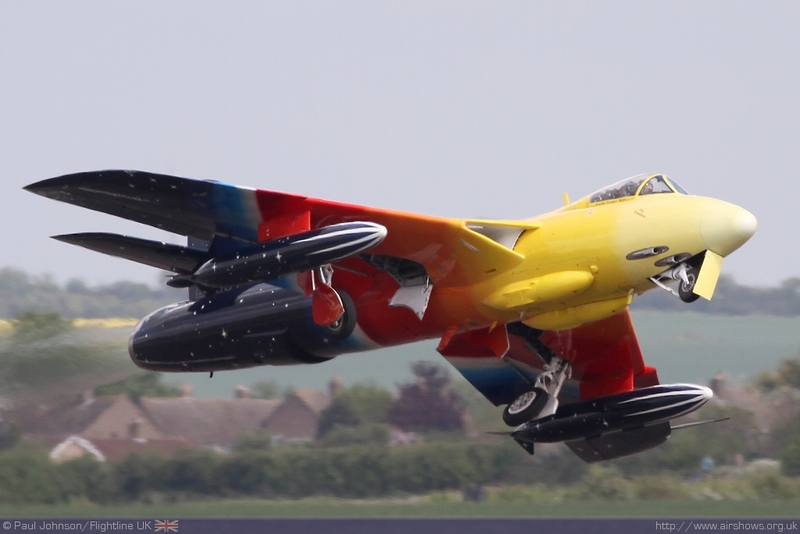 As more information came in on the position and extents of the forecasted ash both the Hawk T1 and the Tucano T1 displays eventually flew in the display though the Typhoon and Lancaster remained grounded. 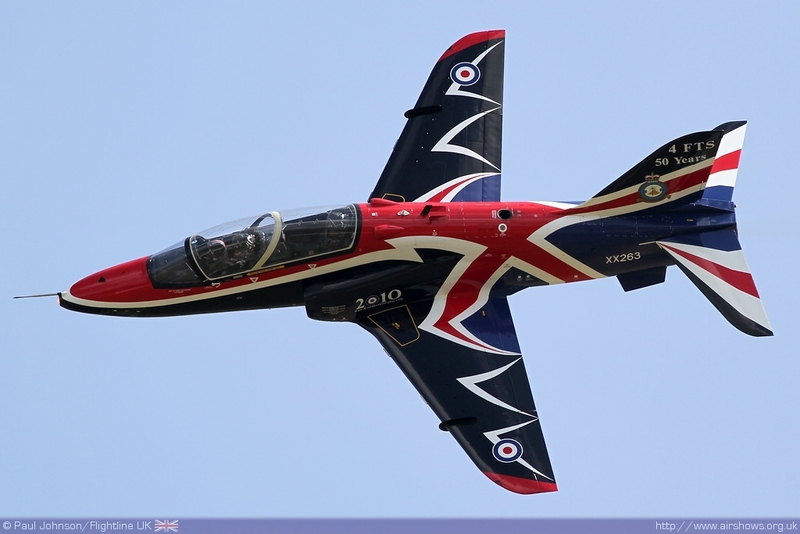 The Hawk, flown by Flt Lt Tom Saunders, is certainly eye-catching in it's 2010 display scheme. Tom has developed a very original display sequence which includes a "dirty" pass as well as a inverted barrel roll! 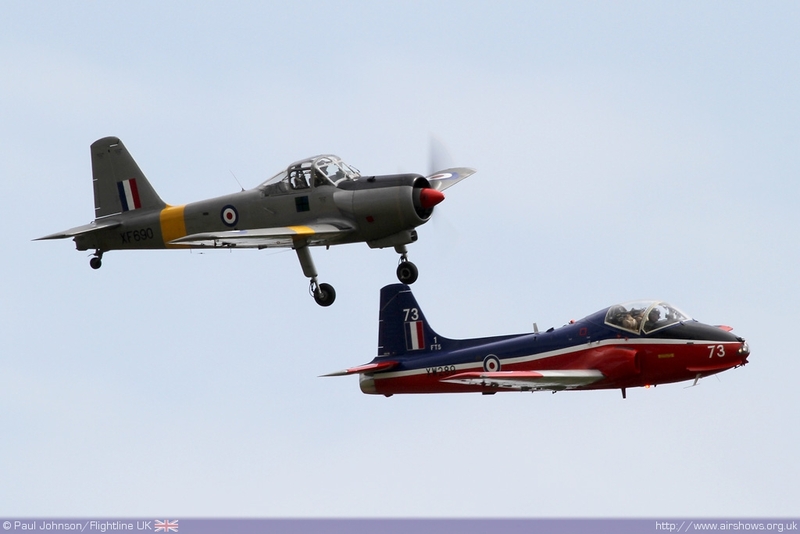 The Tucano T1 also looks very different for the 2010 display season with both nominated aircraft wearing Battle of Britain Spitfire schemes depicting former leaders of 72(R) Squadron. 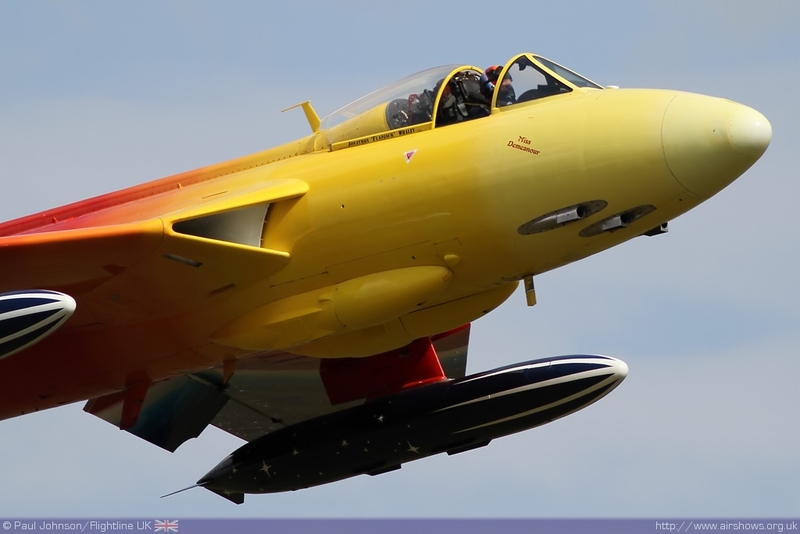 Returning for a second season is Tutor T1 display pilot Flt Lt Bill Ramsey. Bill has further refined his routine which is a welcome break from the noise of some of the more potent types. 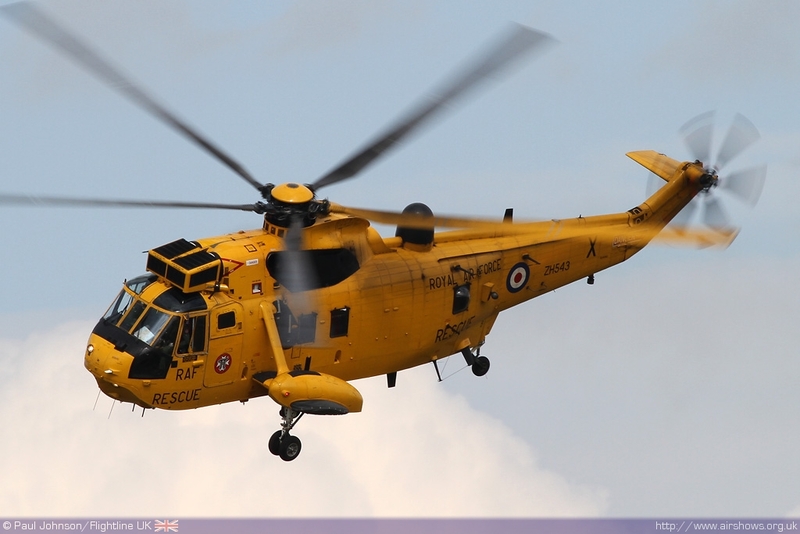 Joining the regular solo displays to complete the modern RAF displays was a Westland Sea King HAR3A from 22 Squadron based at RAF Wattisham which performed a role demo. 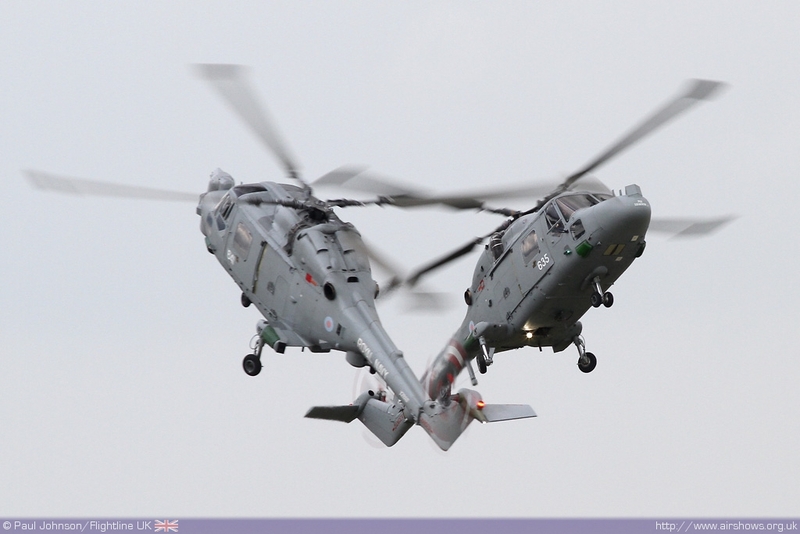 The Royal Navy were not left out with the first outing of the year for the Black Cats display team flying a pair of Westland Lynx HAS3/HMA8 helicopters. 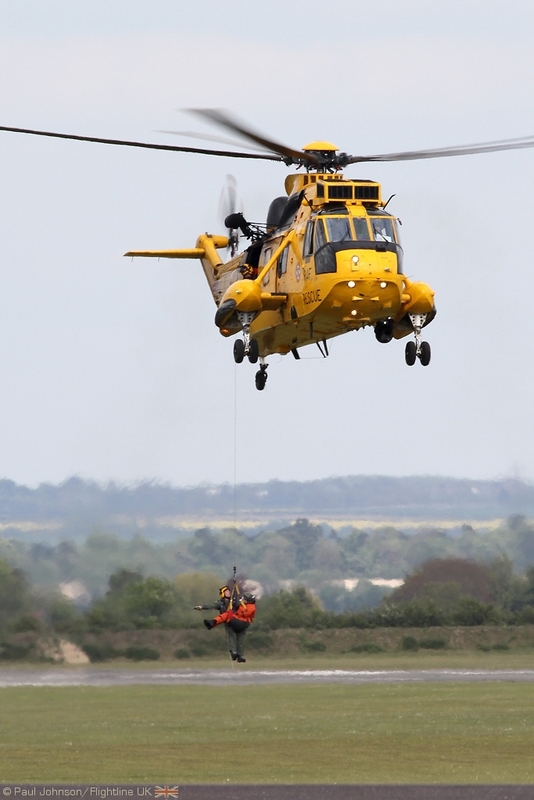 The team this year are led by Lt Becky Frater, the first women to lead a UK military aircraft display team. The rest of the display focused on the RAF's past endeavours. 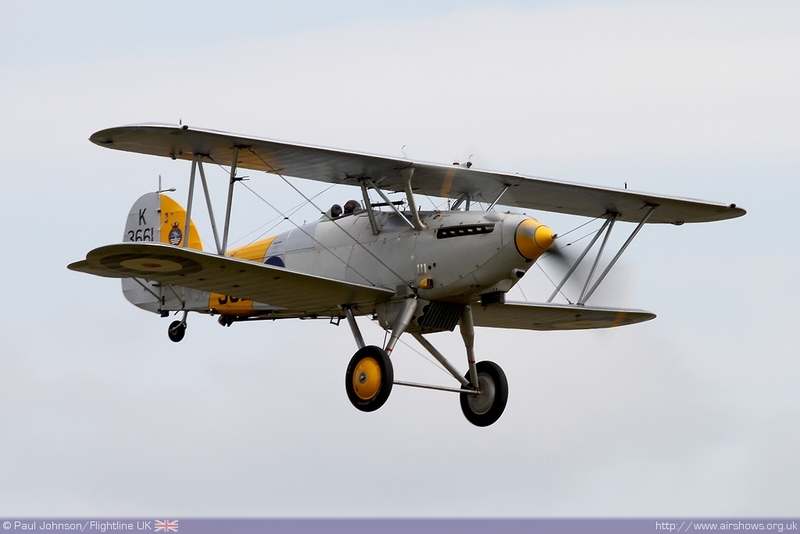 The earliest machines to take part were the RAF SE5a and Bristol F2b Fighter from the Shuttleworth Collection. 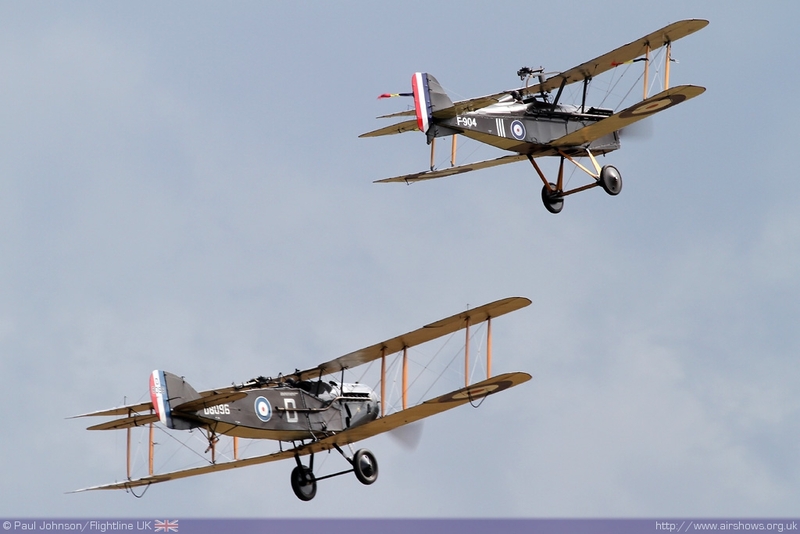 Both aircraft were in service when the Royal Flying Corps and Royal Naval Air Service merged in April 1918 to form the RAF. 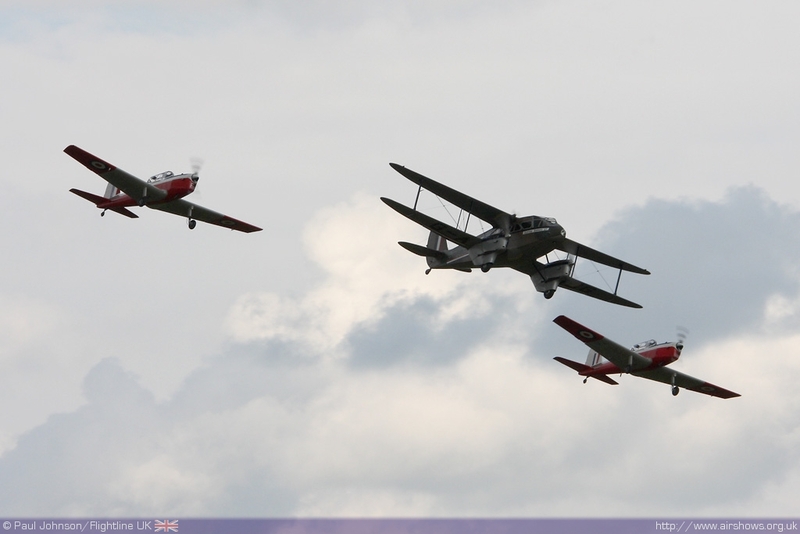 The inter-war years are always a difficult era to represent in flying displays as the machinery from that time is very rare. The Historic Aircraft Collection's Hawker Nimrod put on a graceful display of aerobatics in the blue Cambridgeshire skies in the hands of Charlie Brown. 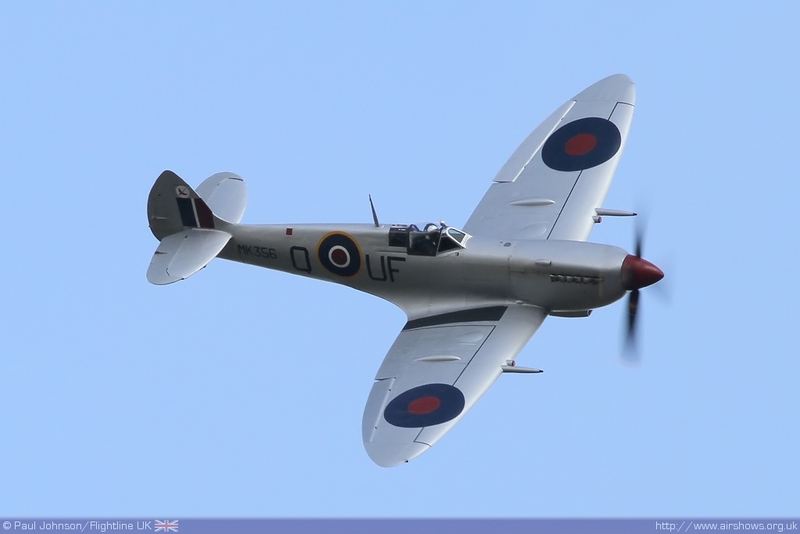 With the presence of so many home-based warbirds and the Battle of Britain Memorial Flight, the early 1940's were very well represented with some very special displays to mark the 70th anniversary of the Battle of Britain. 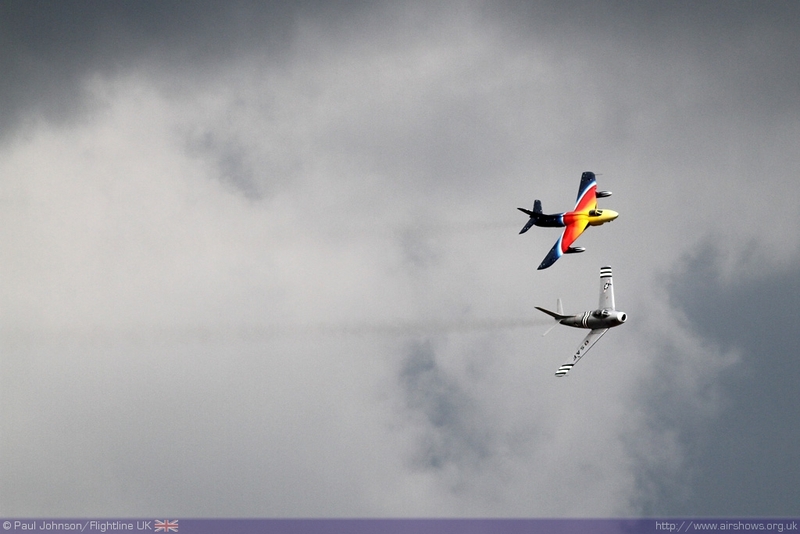 Opening the show was Peter Vacher's Hurricane I flying together with the BBMF's Spitfire IIa. 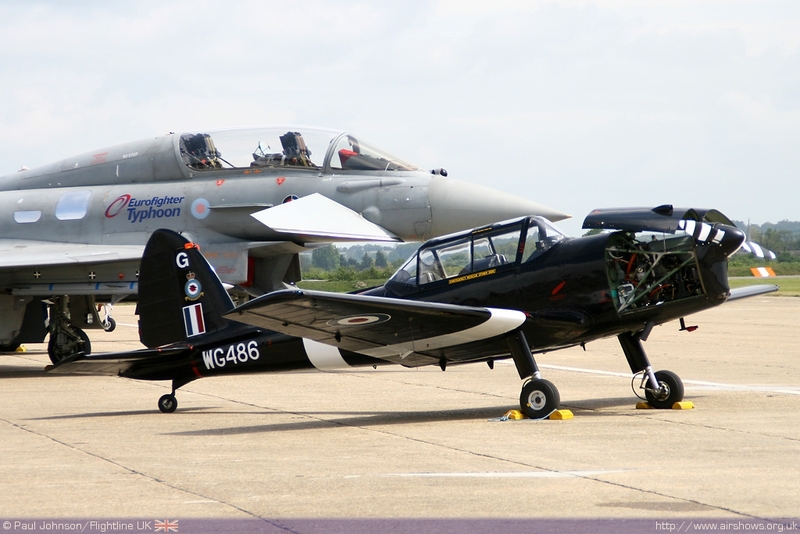 Both aircraft are very rare survivors from the Battle of Britain and hopefully the pairing will be seen at more events during 2010. 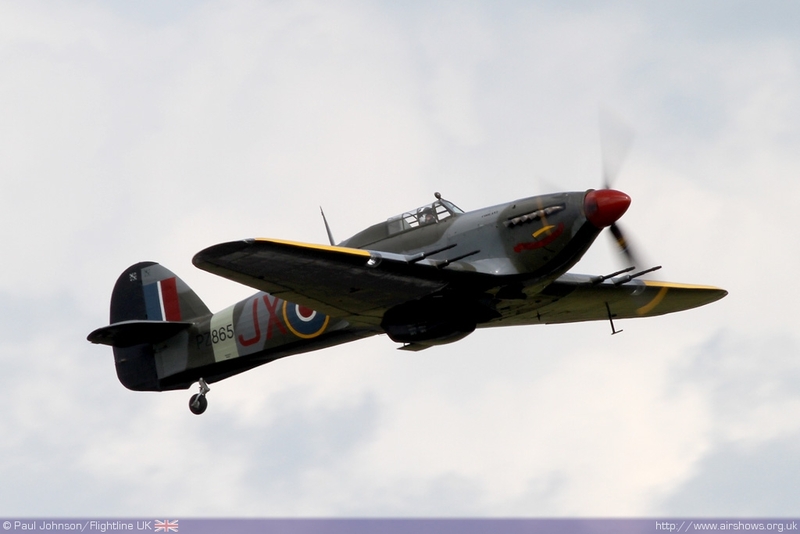 Later on there was a further special formation involving one of the BBMF's Hurricane IIc, Peter Vacher's Hurricane I and the Historic Aircraft Collection's Hurricane XII. 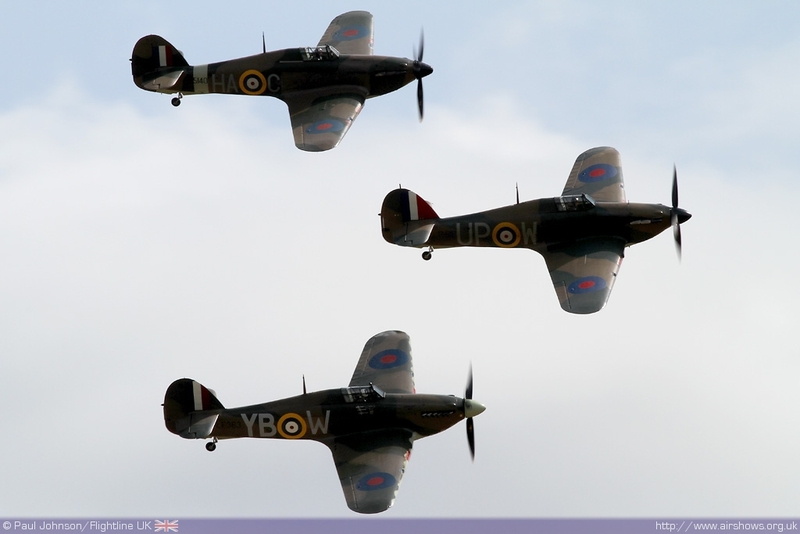 It was unfortunate that the second BBMF Hurricane could not take part in this very special and rare formation. The BBMF's Dakota also flew a display later in the afternoon. 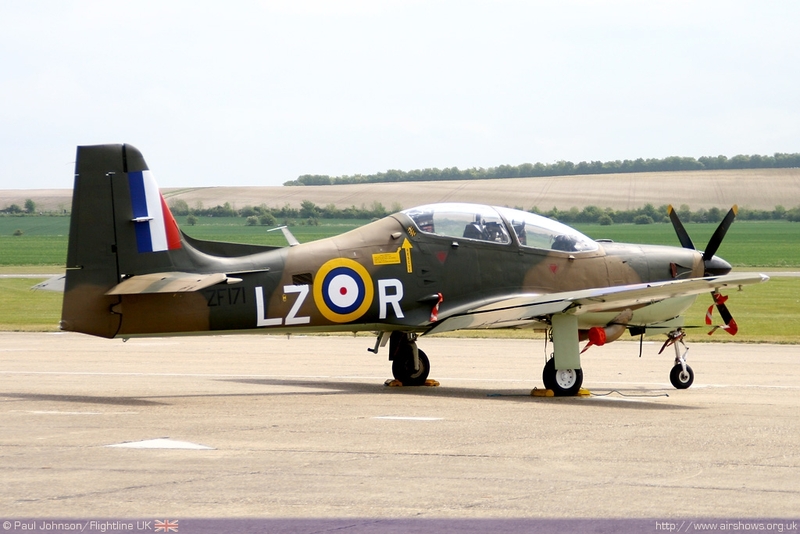 It was heartening to see three aircraft from The Fighter Collection displaying at Duxford after a difficult year which has seen much of their fleet grounded over paperwork issues. 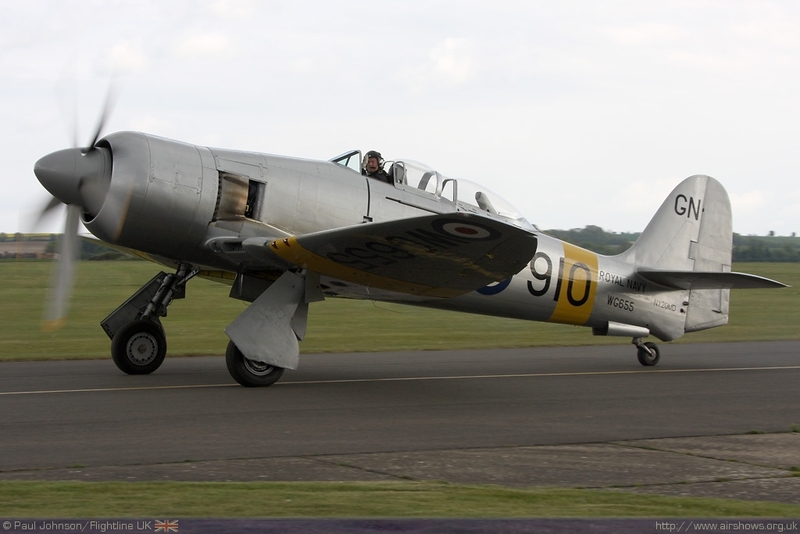 Stephen Grey was first to display in the TFC operated Hawker Sea Fury T20 with his using flair for displaying powerful piston engine fighters. 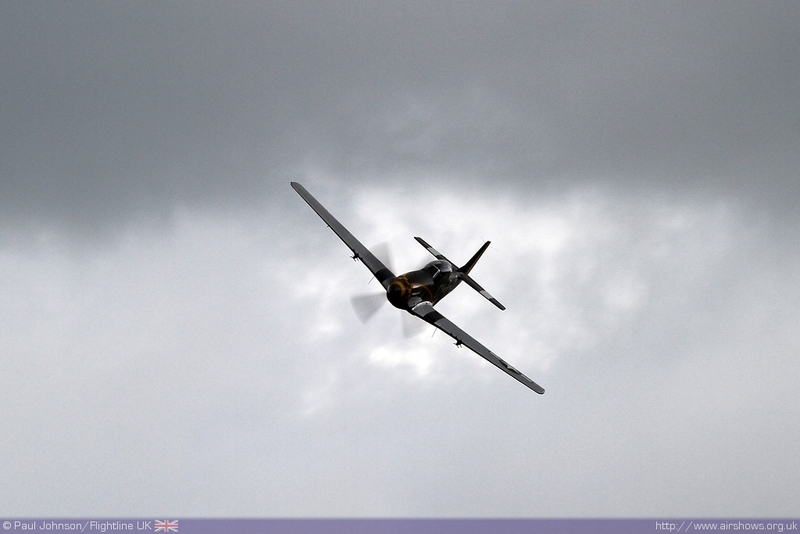 Further displays were given by Pete Kynsey in the TF-51D Mustang and Anna Walker in the North American Harvard. 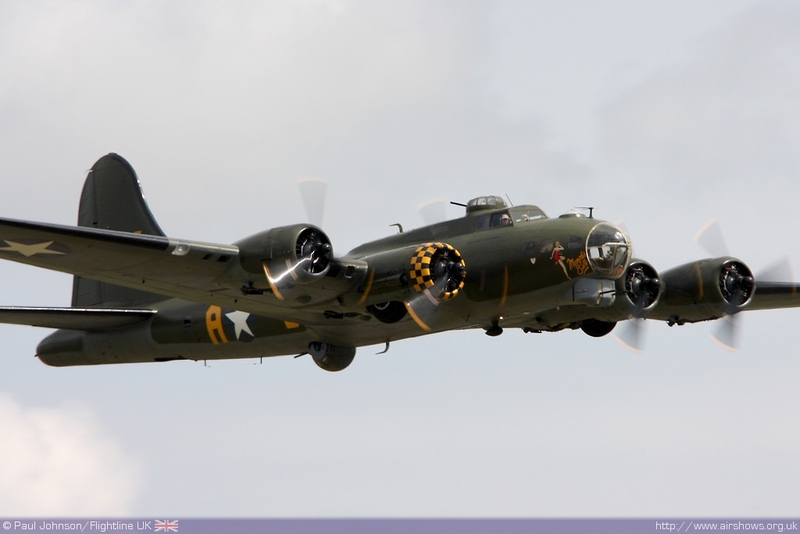 B-17G Flying Fortress Sally-B also displayed represented the RAF's use of the American bomber during the Second World War. There were some other unusual groupings of aircraft during the afternoon. 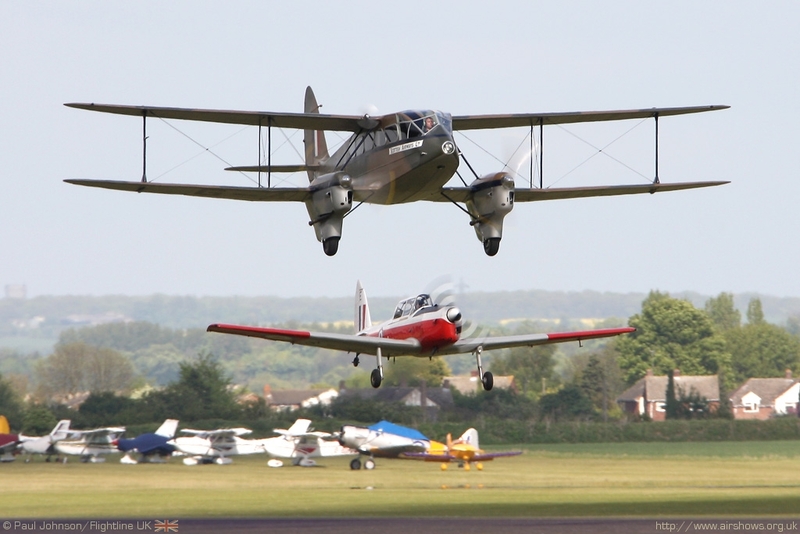 A special "De Havilland" formation featured the Miller's wonder De Havilland Dragon Rapide alongside a pair of De Havilland Canada Chipmunks from the Aircraft Restoration Company. 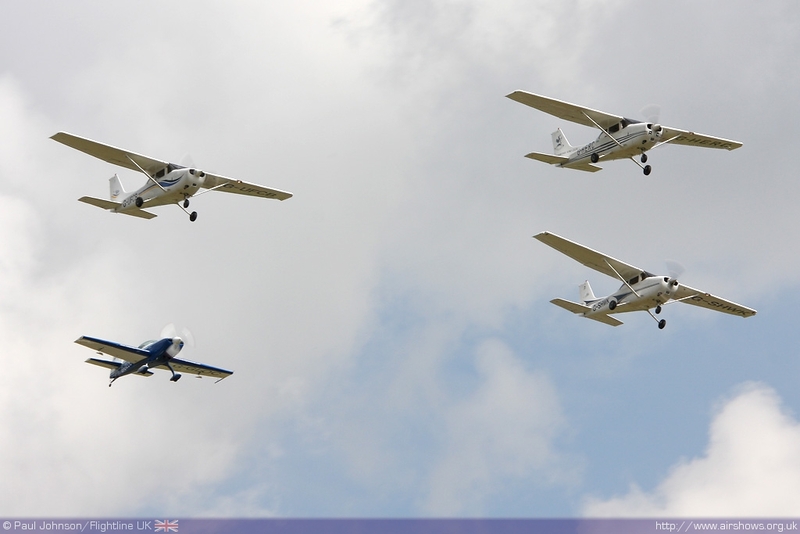 There was a also a special formation marking Marshalls contribution to the Royal Air Force featuring three Cessna 172s and an Extra 200 from Cambridge Aero Club and led by Andy Sephton. There was a welcome array of Cold War types in the display. 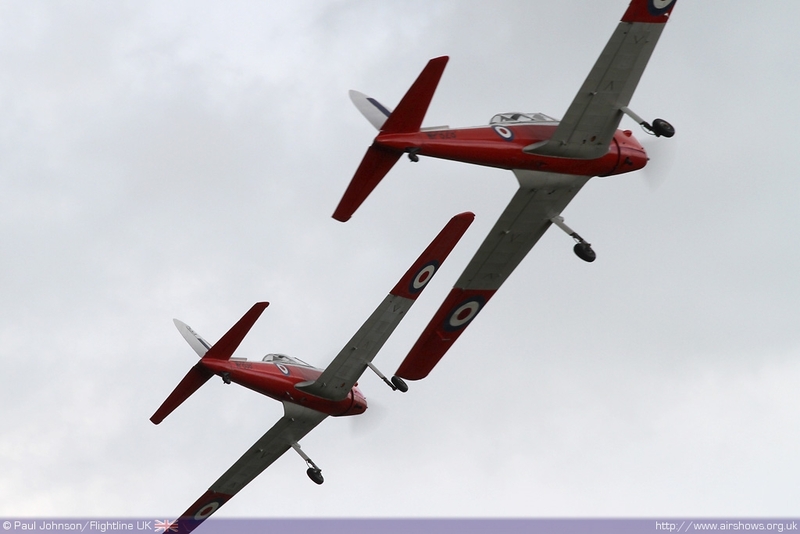 Andrew Dixon displayed his Percival Pembroke while Cooke Aviation flew their Percival Provost T1 and BAC Jet Provost T5. 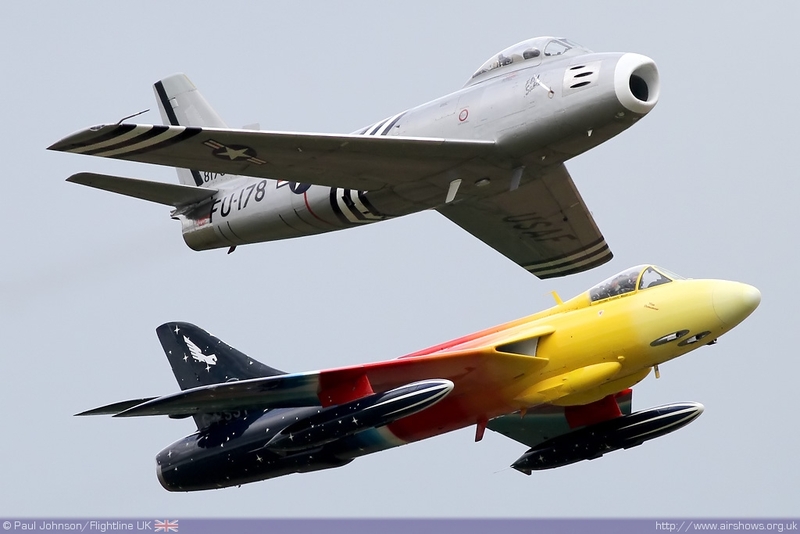 However, it was Jonathon Whalley's Hawker Hunter F58a Miss Demeanour and Golden Apple's North American F-86A Sabre. 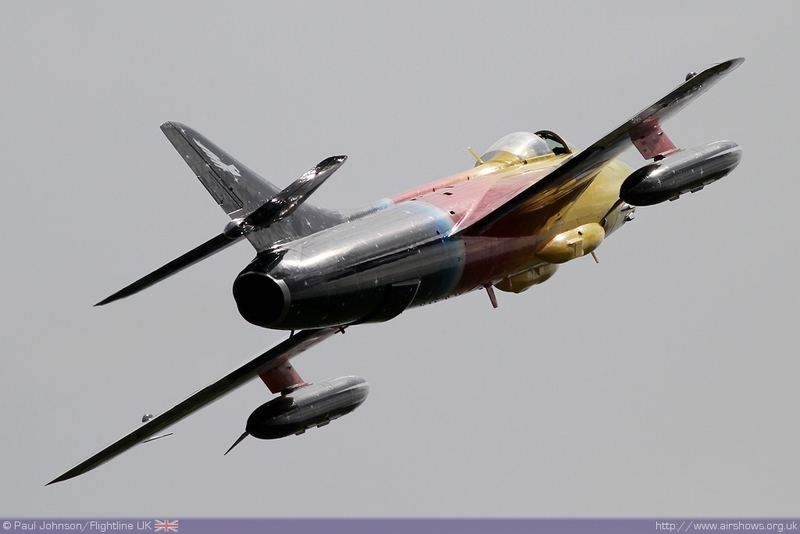 Jonathon flew his usual exciting and noisy solo display early on in the afternoon but formed up with the Sabre on his departure from Duxford for a number of formation passes before a head-on break at crowd centre. Mark Linney always displays the stunning Sabre really well in an elegant routine that was a great finale to fine afternoon of flying. 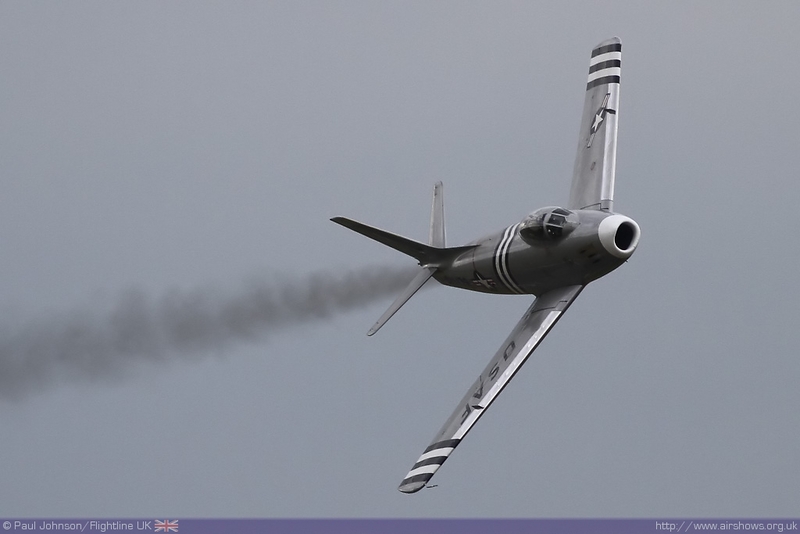 The Spring Airshow got Duxford's season of airshows off to the best possible start considering all the difficulties with as clouds.